ul·ti·mate: adj. Representing or exhibiting the greatest possible development or sophistication. Using the above definition, FOX's new "Bruce Lee Ultimate Collection" really should be titled "Bruce Lee Pretty Good Collection." The potential for an Ultimate Collection is there, but the time and care hasn't been taken to produce it yet. First problem is that Bruce Lee's best film "Enter the Dragon" is owned by Warner Brothers. Warners is Warners and FOX is FOX and never the twain shall meet. It would be nice if they did. This summer, Turner Classic Movies showed the restored, and never before seen version of the famed Pagoda of Death footage that Bruce Lee filmed before his death. The lengthy sequence was raided and cut down for the lame "Game of Death" released in 1978. 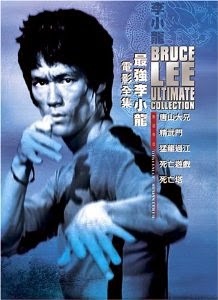 An Ultimate Collection would include Bruce Lee's unfinished, but very compelling version of "Game of Death" also. Of course, that means a third studio would be involved. How to split the profits? How else could you build the Ultimate Collection? DVD fans love extras. How about A&E's Biography of Bruce Lee, or E! True Hollywood Story of Bruce Lee, or even the excellent feature film "Dragon: The Bruce Lee Story"? There are also tons of archived interviews with Bruce Lee himself. I guess a fan can dream. I am a fan. I remember sitting in the cafeteria of Central High School in Memphis at the beginning of 10th grade talking about Bruce Lee's recent death. What a shock it was. The man had burst upon the world stage like a meteor. He had the charisma of Elvis and martial arts skills like none before or since. The fan base is there to support a truly Ultimate DVD Collection. Maybe someday, the powers that be will cooperate with each other and put out that dream boxed set. Until then, let's look at what we have here. "The Big Boss" (1971) was the first of Bruce Lee's important films. Sure, he had been around for a long time. Just like Jimi Hendrix. Hendrix had recorded and performed with a number of artists, but it wasn't until he redefined himself with The Jimi Hendrix Experience, that the Seattle guitarist became a superstar. Bruce Lee had appeared in a number of films and TV shows. It wasn't until he moved to Hong Kong and hooked up with the Chow Brothers that Bruce Lee became BRUCE LEE. "The Big Boss" was released in the US as "Fists of Fury." The film is the weakest of Lee's completed films. Lee plays a simple country man who moves to the corrupt city. His friends and family obtain a job for him in an ice warehouse. Turns out that the huge ice blocks are used to transport heroin. When Bruce Lee's kinfolk discover this, they are murdered. Bruce Lee exacts revenge and justice. The fight sequences are outstanding. The film suffers from a slow build up. The Bruce Lee character has made an oath not to fight. We wait patiently for him to break that vow. When he does, WOW! The movie also proves Lee to be a good actor. His angst over having taken the life of another human being (even though justified) is very moving. "Fist of Fury" (1972) is by far the best film in this collection. Released in the US as "The Chinese Connection" this is a period piece set in 1930s Shanghai. Bruce Lee is the star student at a martial arts school. His master emphasized the spiritual aspects of the skill. Though Bruce Lee could kill easily, he must not use his skills to do so. The film starts with the funeral of Lee's master. He was killed by a rival school run by the Japanese occupiers of his country. In "Fist of Fury" Bruce Lee is a time bomb waiting to explode. He wants revenge. His fellow students do what they can to hold him back. There is a star-crossed lovers subplot that works. Lee must forego earthly pleasures to defend the honor and lives of those he loves. This film includes one of Bruce Lee's best action sequences ever. The nunchaku fight between Lee and a dozen attackers has never been duplicated. On July 20, 1973, six days before the premiere of his greatest film, Bruce Lee died of a cerebral edema. Like James Dean who died before the release of "Rebel Without a Cause" or "Giant", Bruce didn't live to see the public response to his greatest work. "Enter the Dragon" remains the classic martial arts film of all time. Prior to filming "Enter the Dragon," Bruce Lee went to work on a movie about a fighter who takes on the best fighters in the world in a Pagoda of Death. Each floor of the tower is inhabited by a master who is greater than the one below him. This footage would provide the foundation for one last theatrical Bruce Lee film. "Game of Death" (1978) serves no purpose in the universe. The film was built around some exciting footage of Bruce Lee's last unfinished film. Lee's story was abandoned for another hackneyed plot. US actors such as Dean Jagger, Gig Young, Colleen Camp and Hugh O'Brien were hired. A look-alike actor was used and this film was built. The plot involves an actor (Bruce Lee) and his singer girlfriend (Colleen Camp) being forced to sign contracts with evil producers. Forget about it. The film features three fight scenes with the real Bruce Lee. Skip to the end to watch them, or better yet, try and find the TCM restoration I mentioned before. It includes much more footage and tells a coherent story. If a movie makes money, chances are there will be a sequel. How else did the travesty "Game of Death II" (1981) come into being." There are no fight scenes with Bruce Lee anywhere in the movie. There are a number of dubbed outtakes that just look silly. The inclusion of this movie into any set that claims to be an Ultimate Collection is really nothing more than an attempt to make money on the bones of Bruce Lee. It is really an insult to his memory. One great film, two good films and two wastes of time. Great picture. Terrible sound. OK extras. The films have been restored. The color is excellent. "Fist of Fury" is by far the best. The colors on that beautiful film are lush, rich and well-saturated. No artifacts, pixilation. There are some delineation problems on "The Big Boss" as well as the Game of Death films. The sound is way off! The levels are not balanced. It is really a mess. I watched the English track with subtitles so as to not miss the dialogue. It is actually preferable to watch the movies in Mandarin or Cantonese and read the subtitles. It is fun to note that the English subtitles don't match the English dubbing! There are some good interviews with a number of artists in Hong Kong who worked with Bruce Lee. Each disk also includes trailers and photo galleries. The "Game of Death" disks include outtakes which were used in the TCM restoration I mentioned above. There are some good interviews with a number of artists in Hong Kong who worked with Bruce Lee. Each disk also includes trailers and photo galleries. The "Game of Death" disks include outtakes which were used in the TCM restoration I mentioned above. Die-hard fans will want this until something better comes along. I understand that there is a foreign compilation that is somewhat better for the inclusion of much historical supplements. I can't say for sure because I haven't seen it. This is the Pretty Good Collection. I'm still waiting for the Ultimate Collection.